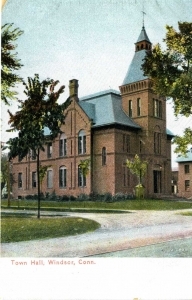 Description: Tinted postcard of the old Town Hall in Windsor, CT. It was located on Broad Street at the corner of Maple Avenue. This building served as the Windsor Town Hall from 1878 until it’s demolition in 1967.